You want to know why so much of modern conservative Christianity makes people want to vomit? You want to know why so many people believe that conservative Christianity is largely a religion of the self-righteous and privileged? You want to know why God surely cringes with a divine face palm nearly every time conservative Christians flap their gums? Why? Because, at times, we stay stupid ignorant stuff—especially when what is needed most is either our complete silence or the taking of swift meaningful action. We are so biased, pretentious, greedy, and dripping with double standards that we have become nose-blind to our own religious stench. It’s as if Jesus is so far removed from our faith that we can’t even summon a smidgen of His likeness when it counts. 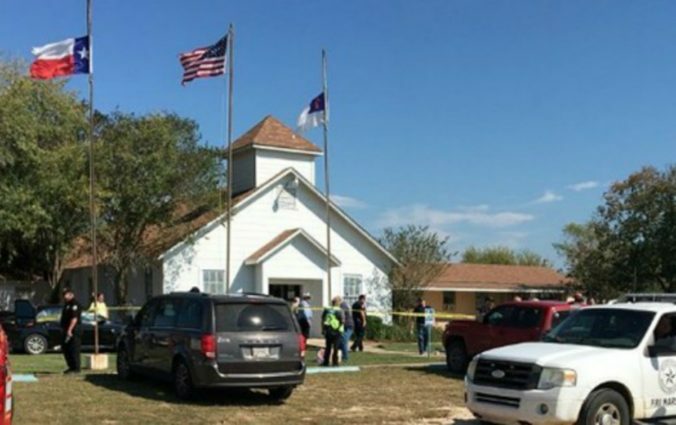 Tragically, just days ago, 26 beautiful humans were brutally murdered while gathering for worship and prayer in their church in Sutherland Springs, Texas. Once again, a semiautomatic rifle was used to accomplish mass murder as they had been before in Orlando, Aurora, Las Vegas, Sandy Hook, and San Bernardino—starting to see a pattern? In fact, it was an Evangelically elected President Trump who in February signed a bill into law in order to roll back an Obama-era regulation that made it harder for people with mental illnesses to purchase a gun—all to the praise and high-fives of many conservative gun-loving Christians. All of this, while a blatant bloody stockpile of evidence is ever-growing in its clear declaration that we have a monumental gun problem in America, largely at the feet of conservative Christians who worship their firearms far more than the Jesus of their faith. In fact, in response to this most recent hellacious mass murder of a gathering of good people praying, seeking, and desiring the favor and blessings of God, the callous reaction of many conservative Christians to this tragedy was to send their “thoughts and prayers,” quickly deflect the issues of gun violence, and tell the American people that we should be more prepared and vigilant as potential victims of shootings—which I am sure would have made all the difference for 5-year-old Brooke Ward who was murdered within a matter of seconds upon the entrance of Devin Kelley into her sanctuary with trigger pulled. Are you kidding me? Thoughts and Prayers? What the hell do you think these people were doing in that church? Tell me this isn’t the sum of your faith. Tell me these aren’t your best ideas as to how to manifest the heart and will of a nonviolent Jesus in the midst of a growing list of countless murderous tragedies empowered by a lust for guns, privilege, and the insisting upon of your rights, even to the present and future deaths of countless lives. Truly and obviously, with hollow sentiments like that, it appears your prayers have become a spiritual veil to an empty faith devoid of a love that leads to action. If you can’t meaningfully restrict your gun rights for the sake of the lives of your fellow human beings, one thing is most certainly clear—you apparently don’t know Jesus, nor worship Him as Lord. Your guns, your rights, and your privilege have become your master, and the needless blood of countless mass shooting victims is dripping down your evil cowardly hands—that’s the truth. So, stop sending your thoughts and prayers, the world knows that when push comes to shove, you don’t truly give a crap. In fact, it appears that nothing is more important than the furthering of your white male heterosexual conservative Evangelical Machine. You could leverage the turning of the tides in a violent gun-worshipping America, but you don’t, and sadly, it seems that you won’t. We can read between the lines, and we have become wise to your spiritual sleight of hand—your privilege is more important than people, period. Until we see you leading the way towards real meaningful gun control. Until we see you encouraging your fellow conservative Christians to support and call for significant gun restrictions. Until we see you stand up and walk away from kneeling at the throne of the NRA. Don’t be surprised when all your spiritual bloviating, grandstanding, and parading of Jesus is met with the middle finger of many in America—myself included. The world doesn’t need your thoughts and prayers, we need your repentance and authentic desire to actually follow the ways of Jesus when it matters most, and perhaps when it costs you the greatest. Until then, the corrupted fruit dangling off your tree will be met with our fierce dismissal and denouncement. For we have tasted and seen that your twisted diabolical conservative Evangelical faith understanding is not good, not good at all—in fact, it’s evil. Conservative Christian, stop sending your thoughts and prayers—start repenting and surrendering your worship of guns before more blood is tragically spilled.